Tagged PDF | Accessibility is the right thing to do! Tagged PDF is intended as an aid to businesses, public sector agencies, educational institutions and others in meeting the PDF accessibility requirements of the impending update to the U.S. Federal Government’s “Section 508″. The long awaited and badly needed 508 Refresh substantially raises the bar for high quality PDF accessibility. The new Section 508 will align with ISO 14289, the authoritative worldwide standard for PDF Universal Accessibility (PDF/UA). An accessible PDF is also a mobile-friendly PDF. Mobile PDF readers increasingly include the capability to reflow, so that the document adjusts to various screen sizes. A PDF must be properly tagged to reflow reliably. 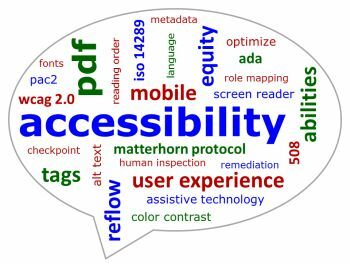 So, even if your documents do not need to be accessible to assistive technology users, PDF accessibility is still vitally important for the huge and rapidly growing number of mobile device users.